identify what type of film you have. Put the projector away and view your slides in digital format. We convert all types of slides on the best equipment around. 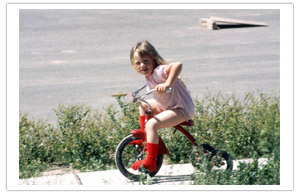 We allow you to view and organize your digitized slides online, and digital color correction is included. 110 Format Slides that are in a 1"x1" mount will incur an additional handling charge. 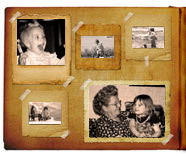 126 Format Slide Film is mounted in a 2"x2" mount. 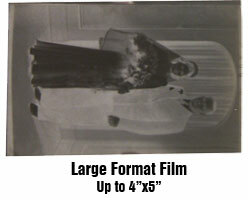 The film size is 28mm x 28mm or 1 1/16" x 1 1/16". or 1 3/16" x 1 3/16". or 1 1/2" x 1 1/2". A stereo slide was originally meant to be a 3-D slide, so the same image is mounted twice in the same mount. We will only scan one of the images and you will only be billed for one image. 35mm Negative Film is 36mm x 24mm or 1 3/8" x 15/16" and has double sprocket perforations. 110 Format film is just like the 110 format slide except it is NOT in a mount. The film size is 13mm x 17mm or 1/2" x 11/16". It costs more to scan a 110 format negative because it's not in a mount which makes it more labor intensive. 126 Format film is just like the 126 format slide except it is NOT in a mount. The film size is 28mm x 28mm or 1 1/16" x 1 1/16". It costs more to scan a 126 format negative because it's not in a mount which makes it more labor intensive. APS Negatives are stored inside their canisters. To convert the APS negative film to digital it will need to be developed prior to sending it to us. We process Silent 8mm, Super8 and 16mm movie film (silent or with sound). Movie film reels can be extremely bulky sitting in storage. It's time to get your reels out of their boxes and bring them into the digital world! With options including digital color correction and high definition transfers, our movie film conversion services will make your memories shine. We will convert your movie film frame by frame, and offer online viewing and editing on all digitized movie film transfers. We convert all types of video tapes to digital. Whether you have the standard VHS tape or rare BetaMax tapes, we can convert it to a DVD. 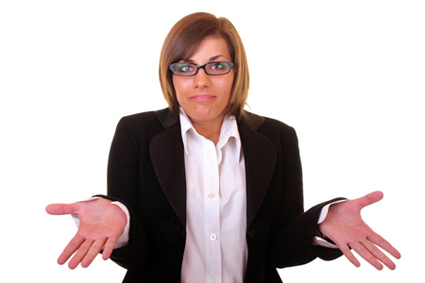 We offer our Video Tape transfers to either a DVD or a Digital Video File saved as an Mp4. 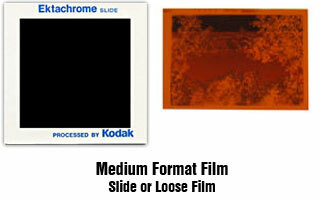 Medium Format Film comes as either a mounted slide or as loose film. Medium Format Film is also known as 120 or 220 film. Medium Format Film ranges in size from 53mm x 53mm or 2 1/8" x 2 1/8" up to 3.75". All our Medium Format Film is scanned on our Nikon 9000 scanner.